10 August 2010, at 9:12a.m. US - An industrial by-product can help clean up water quality in the Chesapeake Bay by trapping some agricultural pollutants in field run-off, according to a US Department of Agriculture (USDA) scientist. For years, poultry farmers on the Chesapeake Bay's coastal plain have amended their sandy soils with poultry manure and litter, which provides nitrogen and phosphorus to growing crops. But phosphorus that isn't taken up by plants remains in the sub-soil, where it leaches out into a vast network of drainage ditches, and eventually drains into the bay itself. So much phosphorus has accumulated in the regional soils that this discharge would continue even if farmers completely stopped using poultry manure and litter for fertiliser. Ray Bryant is a soil scientist with the Agricultural Research Service (ARS), USDA's chief intramural scientific research agency. He has developed an innovative buffer system to mitigate this discharge by digging an auxiliary ditch that parallels an existing draining ditch. Then he filled the new ditch with synthetic gypsum, a by-product produced by the process of scrubbing sulphur from the smokestacks of coal-fired power plants. When the water passed out of the field and into the gypsum-filled ditch, the soluble calcium in the gypsum 'captured' the soluble phosphorus in the water by combining with it and forming calcium phosphate. Dr Bryant found that the gypsum trench could treat the water draining from a field and reduce soluble phosphorus in sub-surface drainage by at least 50 per cent. The gypsum 'curtains' can last for 10 years. Then they can be excavated and the trapped phosphorus can be used again for fertilizer. Another bonus: Power plants do not have to pay to haul the gypsum to a landfill. These auxiliary ditches, in combination with other conservation and best management practices, could help farmers control phosphorus leaching without disrupting current agricultural operations. 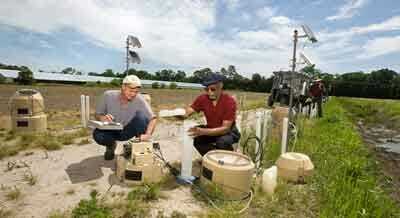 Dr Bryant works at the ARS Pasture Systems and Watershed Management Research Unit in University Park, Pennsylvania. ARS soil scientist Ray Bryant (left) and University of Maryland colleague, Arthur Allen, have found that an underground curtain of synthetic gypsum can filter phosphorus from water that runs off agricultural fields.